So it’s the end of summer, and I have to come to terms with that. Time to use the last of the summer veggies before the go out of season. Luckily, there is inspiration everywhere for cooking delicious dishes and pushing myself in the kitchen (a little prep before entering culinary school, you know). This all started with some rosemary. It usually takes only one ingredient to inspire a whole meal, I’ve found. Like the leaves changing, once one goes, the rest follow with ease. 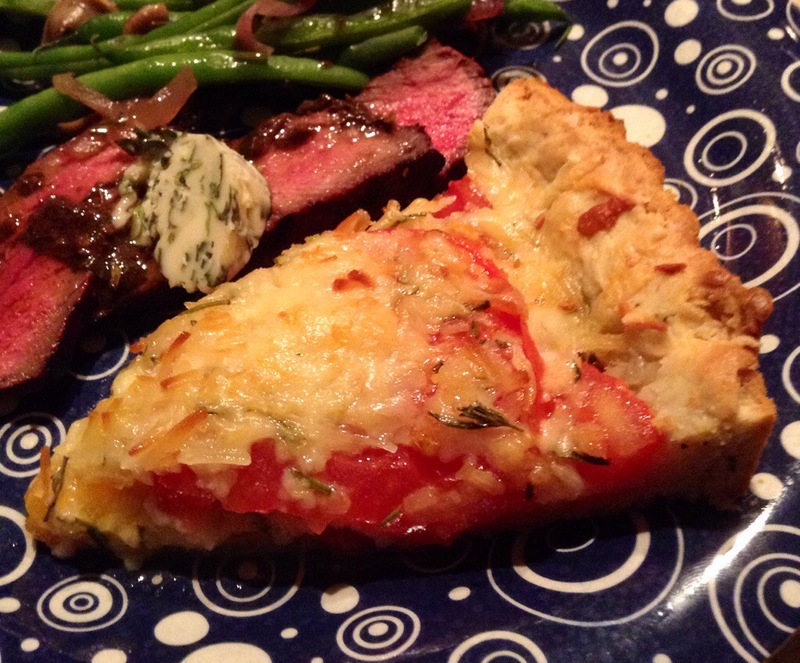 I wanted to utilize the rosemary and some leftover summer tomatoes I had, and next thing I knew, i was whipping up a homemade crust and pairing my tart with steak with a homemade herb butter. A big shout out to Food Network for inspiring this incredible dish, which is great hot or cold, as a side dish or a main course, with a salad or on its own. The night before (or at least a few hours before), make the crust. Combine a tablespoon or so of chopped rosemary, the flour, a tablespoon or so of sugar, and salt and pepper in a food processor. Pulse. Add the butter in small amounts and pulse until mealy and somewhat combined. Whisk 2 eggs and 1 yolk together in a bowl and add to the dough mixture and pulse to combine, until it forms a ball. Roll out onto a floured surface. I found I needed a lot of flour til the dough came together, but everyone is different. Roll until the dough comes together, then flatten into a springform pan. Let chill in the fridge for a few hours or overnight. When you’re ready to make the tart, preheat the oven to 400. Slice your tomatoes and set on a plate and sprinkle with a little salt. This will help release some of their juices so the tart won’t get mushy. Take the crust out of the fridge. Mix the cheeses together with a few more tablespoons rosemary, leaving a handful of parm on the side for topping. 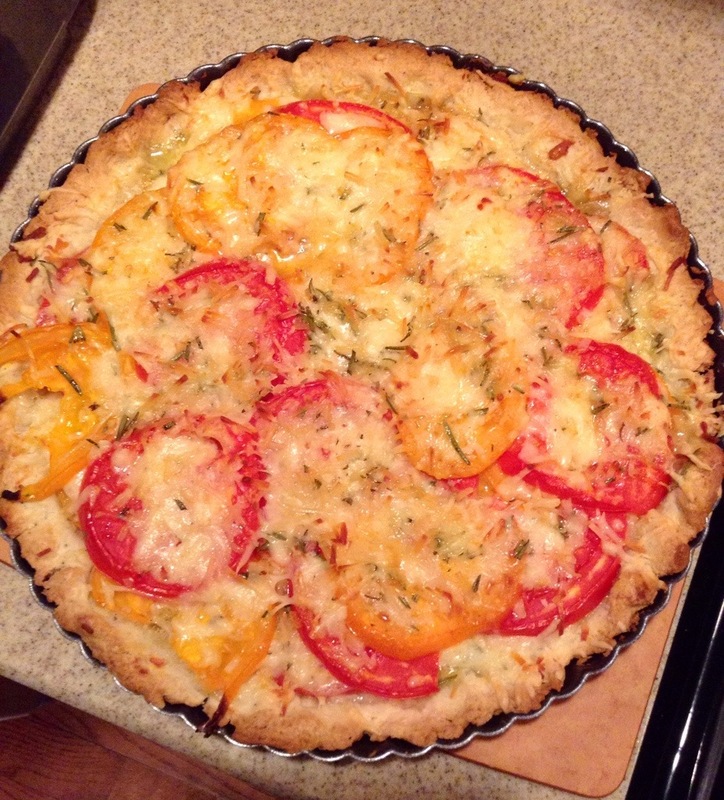 Pat your tomatoes dry with a paper towel, then sprinkle a little panko in the bottom of the crust. 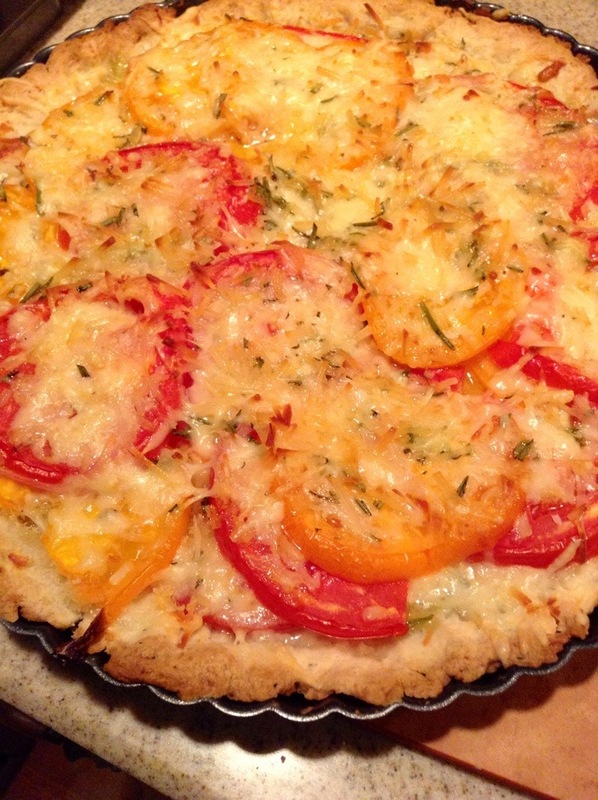 Top with half the tomatoes and the cheese mixture, then layer again until you have reached the top of the crust. Top with more cheese (more cheese=more fun). Drizzle olive oil over the top. Pop in the oven for about a half hour, or until the tart is nice and bubbly and browned. Let sit for a minute and then slice and enjoy! I promise leftovers will be few, if any.